The University of Guelph Campus Community Police are proud to announce that a new campus safety app for smartphones is available to our entire campus community. This app is a step towards our commitment to improving safety on campus. The use of smartphones is the most common way we communicate, share with others and is an integral part our daily lives. 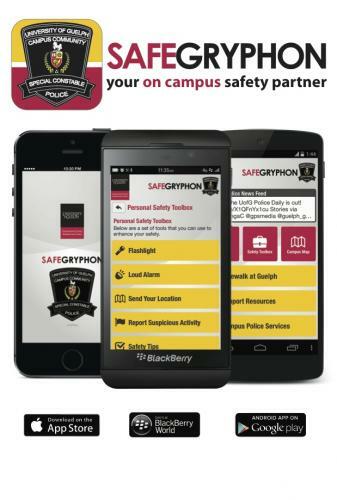 SAFEGRYPHON app is your personal companion during your school experience here at the University of Guelph. Click to call - In an emergency, time is of the essence. Putting you in contact of emergency services is two screen taps away. Push notifications - SAFEGRYPHON has the power to protect you and keep you safe while on campus. Emergency notifications are received through this app and displayed on your smartphone even when the app IS NOT running. 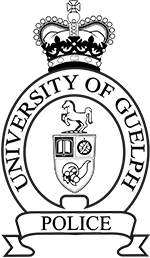 Custom Real-Time Mapping - find interactive customized maps of the University of Guelph Campus. You can even email your GPS position in real time. Personal Alarm and Flashlight - Draw attention to yourself in an emergency situation by sounding a loud alarm. The flashlight feature is also important in the event of an emergency or for personal safety. We are encouraging all of our campus community to download the SAFEGRYPHON. It is available for FREE at the Apple App Store, Google Play and BlackBerry World.